Seven years ago I was going bankrupt and getting divorced..
And I decided to use the last balance of my credit card and travel to Garda lake in Italy together with my friends Miikka and Antti for one week. I had been an entrepreneur for 8 years and was totally burned out financially, emotionally and mentally. Before traveling to Garda lake, the direct sales company we had worked incredibly hard to build a decent business with was going bust after six years. On top of that my investments backed with huge personal loans (don’t try that at home) were also backfiring and two of the companies I was a major shareholder in were going bankrupt. Two weeks before we travelled to Italy I had started as a partner with a Swedish direct sales company called Zinzino. My hopes were not too high because I was totally burned out. Also because I was so immersed in all the adversity related to my business, I had actually totally neglected our relationship with Anita for too long and had taken everything for granted. Somehow during the week I was able to turn my fears of bankruptcy and loosing an once amazing relationship with Anita into hunger. I decided to turn things around and I felt that zinzino came into our life for a reason. When we got home I started to work with the business but getting started was tougher than I thought. I felt that I had burned too many bridges because of so much adversity and failure. I remember walking out from a few business presentations because I just couldn’t see how I could get to even break even with my finances. Despite of great mentors I quit more than anyone in my team but i also managed to fight back every time I was feeling down or filled with fear (which was several times a day in the beginning). And for once in my life I decided to focus one course until successful and persevere through the pain and fear. I also decided to not take things so serious, trust my intuition and take it step by step. And here we are again in Verona, Italy after seven years, with my best friends (thank you Anu for organizing) who I have built an incredible business and travelled around the world together with, who are Godparents to our kids, best men at our wedding and best business partners one could ask for. The last seven years have been the most challenging but at the same time the most rewarding in all possible ways. After five years of hard but rewarding work, my bankruptcy turned into freedom and our almost divorce turned back into love with two wonderful boys as strawberries on top of (and in) the cake. We should all have a license to fail because we can only get to success through failure. “It doesn’t matter how many times you fall, it matters how many times you get up and keep moving forward”. Thank you once more to Manu, Olli, Ørjan and Anita and to many others for believing in me when I didn’t see the light myself. Thank you also to Zinzino and my team for being the greatest in the world. Let’s continue thriving and making history together. After working quite intensely with my main business Zinzino for five years and after having our second son, Arman, we decided to move to south of Spain for a while to live a more laid back lifestyle. My Dad wasn’t around much when I was growing up so one of my goals was to have an opportunity to be home more with my kids especially when they are small. These are the best and at the same time the most challenging times I have experienced. Nothing teaches us more than our own children. It’s a true leadership challenge that never ends. I’m so grateful that I have had the chance to watch them grow and be there to play with them. Me and my wife, Anita, also had a chance to work more on our physical and mental well being and it has been a true blessing. After chilling in Spain with la familia for two years it’s great to be back in the game of inspiring people to change and to follow their dreams. True happiness I have learned comes from growth and contribution. We love living in and working from the old town of Tallinn now. This city is so alive, and we love the medieval energy combined with a great startup and entrepreneur friendly environment! Here are the 3 Most Important Questions to unlock that blueprint. 1. What kind of experiences do you want to have? 2. How are you ready to grow to make those experiences happen? 3. How will you contribute? 1. Travel around the world while Inspiring people to change and to follow their dreams. 2. Having a healthy and lean body. 3. Being happy and having peace of mind. 4. Having a healthy and happy family. 5. 3-6 month sabbatical every few years with family traveling around the world meeting our friends & having the time of our lives. Returning home to a business that has continued growing. 7. Keynote Speaker at Mastermind Event and Go Pro Recruiting Mastery. 8. Giving a ted talk. 1. Have a super effective mind focused on doing the right things. 2. Be more present with myself and my family. 3. Listen more to my intuition. 4. Connect with my spirit. 5. Mindvalley Academy and A-fest every year. 7. Read 2 books on areas I want most growth on every month. 8. Become a world class speaker and mentor. 9. Meeting with a mastermind group that are doing better than me consistently. 1. Inspiring people all over the world to change their lives and go for their dreams. 2. Be able to help when needed. 4. Be the best role model and example to my children. 5. 100.000 Active customers in balance in my Zinzino business. 6. “Be the change I want to see in the world”. What are your answers to the 3 most important questions? Thank you for reading and I wish you an amazing day! My biggest goal in my career as direct sales professional has finally been accomplished! I am so excited and grateful that it´s hard to explain. Thanks so much to my upline and especially Manu Rekola, Olli Salminen, Jari Pohjonen, Toni Tillonen and Hilde & Ørjan Saele for helping me turn my dream into reality and believing in me when I didn’t believe in myself Thanks also so much to my powerful dream teams! You guys are truly awesome! Love you guys! Together to the top! Service to many leads to greatness! I will continue serving and helping you guys and so many others for the rest of my life. Don’t delay it, take Action now! Onko tietotaito ja asenteesi suoramyyntialaa kohtaan viime vuosituhannelta? Jos et tiennyt, niin suoramyynti on yksi maailman nopeimmin kasva-vista megatrendeistä. Olen toiminut sarjayrittäjänä yli kymmenen vuotta ja ollut osakkaana noin 20 yrityksessä. Olen ollut todistamassa nousuja ja laskuja useissa näissä eri alojen yrityksissä viimeisten vuosien aikana. Kaikista yrityksistäni suoramyynti on ollut nopein ja riskittömin tie, sekä minulle että monille ystävilleni – saavuttaa jatkuva, automatisoitu tulovirta ilman taloudellista riskiä. Olet ehkä kyllästynyt jatkuvaan oravanpyörään ja loputtomiin työtunteihin sidottuna toimistolle. Suoramyynti on ala siinä missä muutkin. Suoramyyntialalla voit edustaa nykyisin maailmanluokan tuotteita. Minä ja perheeni arvostavat tuotteita, joita ovat olleet kehittämässä maailman parhaimmat asiantuntijat ja tiedemiehet. Arvostamme myös luomua ja fair trade -tuotteita. Puolisoni kanssa olemme hyvin kiinnostuneita ravinnosta ja hyvinvoinnista. Jos aihe kiinnostaa, niin seuraa matkaamme tämän blogin kautta Euroopassa ja Yhdysvalloissa. 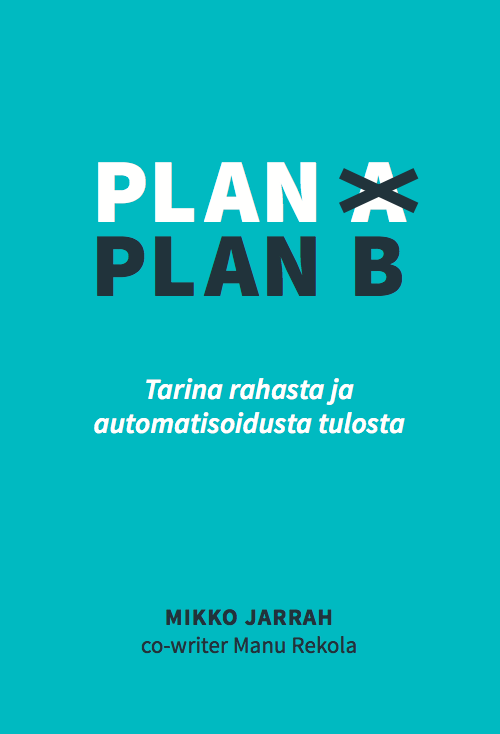 Plan B saatavilla nyt suomeksi! Monet elämän ongelmat voi ratkaista suuremmilla tuloilla, ja toisaalta raha liittyy jollain lailla myös useimpien unelmien toteuttamiseen. Muutoksen aloittaminen omaan taloudelliseen tilanteeseen vaatii vain päätöksen tekemistä ja uuden ajatusmaailman opiskelua rahaan liittyen. Mutta suuremmatkaan tulot eivät ole tae tasapainoiseen taloudelliseen tilanteeseen, mikäli et tiedä miten rahaa kuuluu käyttää. Tässä kirjasessa on kerrottu todellinen tarina siitä, miten rahaan liittyvät uskomukset voivat muuttaa oman ja läheisten elämän. Työkaluna on käytetty alaa nimeltä suoramyynti, jonka suosio on nyt vahvassa kasvussa ja joka on yksi tämän hetken voimakkaimmista trendeistä.